Adorno, in a well known quote, said that Kitsch "is the beautiful minus its ugly counterpart," a kind of purified beauty without a vision of the other - what I suppose might be called the real world - with Hundescheiße and all. Now there is nothing innately wrong with this, and if I were able to somehow tap into a stream of pure beauty in my own meager compositions, I would gladly make use of it, as whatever small respite one can give an audience in this brief life is worth grasping. However, Kitsch, when loved in its unadulterated and unironic form, has become negatively associated, and has become a word used to deny the validity of whatever the speaker doesn't care much for. 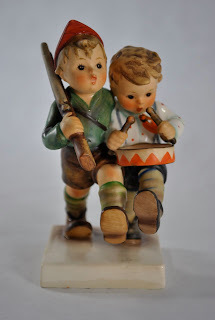 The most obvious examples of the genre, for example the twee Hummel figurines that my friends' parents collected so avidly, and that made me vaguely queasy even as a child, are easy targets for those of us who aspire to the world of ultra-high art. But the point here is more subtle. The notion of Kitsch has something to do with its commodification, packaging up a subject in a manner which is easily digested, gratifying the desires of the viewer-to-be. It is this aspect which I find the most troubling personally. And I have to say that when somebody sets himself up, and for whatever reason (accompanies) maudlin music by singing something or other about Vietnam being unbearable...I find, in fact, this song unbearable, in that by taking the horrendous and making it somehow consumable, it ends up wringing something like consumer qualities out of it." I think this strikes at the heart of art-making whenever it seeks to be a commentary on the horrors of the real world. In a review of Extremely Loud & Incredibly Close, Manohla Dargis comes up with one of my favorite lines: "[Kitsch...] tries to make us feel good, even virtuous, simply about feeling." Now this is a cornerstone of the Hollywood palace of culture, well-evidenced by the immeasurable collection of movies profiteering on all tragedies past and present, from personal misfortunes to those unimaginably horrific. I've often wondered why there is no outcry, given the various institutions dedicated to the preservation of the real memory of the Jewish Holocaust, to the massively vampiric way Hollywood fills its pockets with sweetly sentimental and boffo-at-the-box-office stories concerning it. Stanley Kubrick, who worked for years on treatments of a film about the Holocaust, decided that it simply couldn't be contained in a movie, and made the point that Schindler's List and the others really weren't about the Holocaust at all. But, fundamentally, I fail to see how any digestibly evening-length piece, created for purposes mercenary or self-aggrandizing or otherwise, can contain any tragedy. If my own Certitude and Joy attempts to do that, then in that regard it is a failure. At best, it's an essay, one more bit of ink spilled, one more personal comment on the fringes on the subject and subjects related to it. At worst, it is insidious, a piece that pretends to be real, that plays on the emotions, that allows an audience to believe that the artist has conveyed to them something of the truth, but that sets them outside an hour later on their way to buy another donut. Maybe the middle ground is somewhere in between, a show of light and spectacle and music that uses some tricks to make some points, some of which are interesting; and which is enjoyable sensorially, and which may, if it is lucky, make one think about one's own life. The curious reality of Sister Hummel is that, even though the figures given her name are labeled as shining examples of Kitsch, they capture more of the truth of tragedy through their existence than any artwork looking back from our comfortable present is able to. The figurine pictured is based on her watercolor - The Volunteers - which enraged Hitler, who banned her art, an SA mouthpiece writing "There is no place in the ranks of German artists for the likes of her. No, the 'beloved Fatherland' cannot remain calm when Germany's youth are portrayed as brainless sissies." But even after this, and under Nazi persecution, she continued to produce her works under terrible conditions in an unheated cell with little food, covertly placing in them Stars of David, menorahs and other subversive imagery, dying of tuberculosis before the end of the war. Interesting, Erling. Something to chew on. I will.